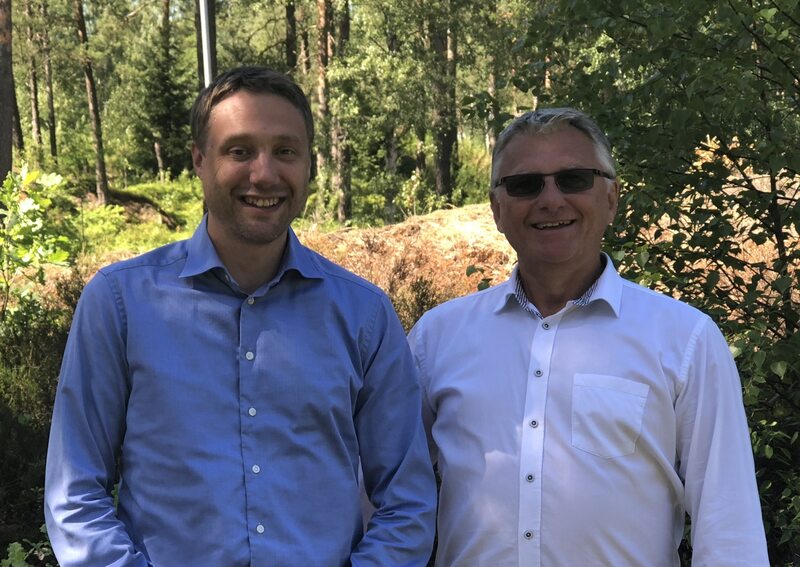 The UMV board of directors have appointed Daniel Ragnarsson as President of UMV Coating Systems. Effective June 1, 2018, Daniel succeeds Ronnie Andersson who will retire. Here are their views on the past and the future, and the story of how this Swedish company innovated their way out of the financial crisis. “When I first started working at UMV, it was all about survival. The financial crisis was slowly subsiding, but most companies were still clinging on to their investment money”, says Ronnie Andersson. “The times were incredibly tough. Investments were still frozen or put off to a more distant future. It would have been easy to just give up, but I felt that the people who work here are way too good to lose their jobs. So, we sat down and thought long and hard about what to do”. Daniel was also working at UMV at the time. He remembers. “We were quite vulnerable to the recession back then. We were mostly involved in replacing outdated coaters, and when the economy slumped, demand fell. We realized that we had to change the strategy before it was too late”. This was around 2011, and the management team worked intensively on devising a plan. The result of that work outlined three new strategic guidelines for the business, which, according to Ronnie, saved the company. With a very strong focus on learning the customer’s needs and what matters most to the customer, you can create products and services that are more tailored to reality. Find the things that your customers are cursing about – then you’ll know how to define their need. UMV went further than most in this endeavor, offering customers the opportunity to use a pilot facility to test and develop their products. This has led UMV to be a vital part of customer’s innovation process, which in turn makes it easier to identify what the customer needs help with. “It has given us the opportunity to understand in detail what the customer thinks is important. Without the pilot machine, we would not have had this big of a breakthrough, in for instance, fossil-free barrier coating”, says Ronnie. By breaking down a process in its parts, it’s easier to develop smarter solutions for each individual part of the process. Look at what you have today and identify small upgrades that can create major differences. ”An example is the INVO® Tip, a metering element where a soft polymeric tip coats the paper web. This system can be mounted on existing coaters and immediately provide better coating quality. You can use it to save coating or raise the quality of your product. On the more creative side, you can work out a whole new type of product that suits your customers needs even better”, according to Daniel. He also talks about a development that is happening right now, where some companies use UMV’s barrier concept when building their own offline coaters. “Demand for fossil-free barriers is very high. We see new players emerging, using our hardware to build an entirely new type of offline coating facilities, that will compete with bigger actors”. By thinking in the long term, you can identify arising demands or problems early on. You can also be quick to close down products that are becoming redundant. When you don’t work quarterly, you can set up more long-term goals and you have more room for maneuvering. That, in turn, can give rise to new ideas and innovations. By implementing these strategies, UMV has turned the curve upwards. Previously, the company was a manufacturer of coating equipment with profitability problems. Now, they help customers around the world to develop their process for producing high-end packaging solutions. Inquiries are coming in more frequent, more orders are received, and the company intends in steps to recruit people in all disciplines to meet the increased demand. It’s been a nice development and Ronnie and Daniel agree that, apart from all committed co-workers, the single most important explanation for success is the UMV pilot line. “Before we had a fully equipped pilot we could only talk about what good concepts we had. Now we can actually prove it, “says Daniel. In the future, Daniel wants to invest in knowledge and continued innovation, to further increase company growth. ”The easiest way to do that is to remove obstacles for development. Ask an employee what prevents him from performing at the top of his ability, and you will immediately find things you can change and improve”. “I see what a difference our products, services and know-how do for the customers. My mission now is to find out what prevents us from making even better and more sustainable products, “concludes Daniel. Daniel has been in the company since 2008. He started out working sales application engineer but soon became a salesman and advanced to sales manager. Recently, he shouldered the role of marketing manager before taking over as President on June 1st. He has studied Mechanical Engineering at Karlstad University.